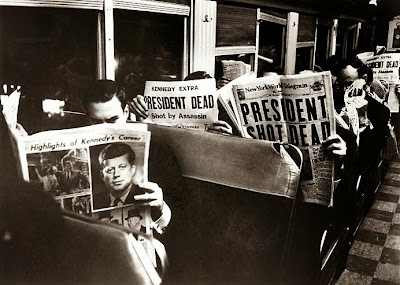 New York commuters read about Kennedy’s murder. 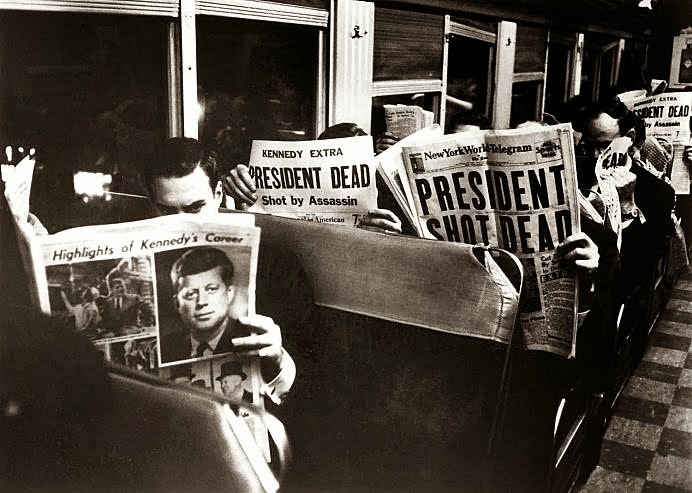 Next month will bring the 50th anniversary of President John F. Kennedy’s assassination in Dallas, Texas. As most everyone reading this post knows already, the 35th president of the United States was shot to death during a motorcade excursion through the “Big D” not long after noon on November 22, 1963; also wounded by sniper fire in Kennedy’s vehicle was Texas Governor John Connolly. Lee Harvey Oswald, a former Marine who’d defected to the Soviet Union before returning to the States, was eventually found guilty of the crime, though he himself died (at the hands of a gun-wielding Dallas nightclub owner, Jack Ruby) two days after Kennedy. To commemorate that tragic anniversary, I’m devoting my Kirkus Reviews column this week to crime and thriller novels focused around Kennedy. Included are works by Max Allan Collins, David Poyer, Francine Mathews, Charles McCarry, and others. You’ll find my full piece here. READ MORE: “The U.S. President and Detective Fiction: Hail to the Chief,” by Janet Rudolph (Mystery Fanfare); “The Story Behind the Story: ‘A Fine and Dangerous Season,’ by Keith Raffel” (The Rap Sheet); “The Presidential Bond,” by Ali Karim (The Rap Sheet); “The Best Novels About JFK’s Death,” by Patrick Wensink (Esquire).